VL: My fellow writer Bradley Harper has graciously agreed to share the wisdom he has acquired in his second career as Santa Claus! I believe you will find this blog as moving as I have. Thank you, Brad! After I retired from the Army, (37 years, 4 months, and 9 days, and yes, someone WAS counting!) I grew a beard because, hey, I could! It came out white, which at my age was no surprise. My wife began hinting that I should try being a Santa. I was very unsure about that suggestion, but over time decided that when she was eight she decided she wanted to marry Santa Claus. So, if she was to become Mrs. Claus … you get the idea. I auditioned for a local park, and to my surprise, and more than a small amount of panic, I got one of the slots. Now I was in for it. I began walking through the toy section of stores. I memorized “The Night Before Christmas.” I speak various languages to differing degrees of proficiency, so memorized how to say “what would you like for Christmas” in Spanish, French, Italian, and German, (the park gets a fair number of international visitors.) I didn’t have to understand the reply. A smile and knowing wink is universal. Day three in the throne. I got this! It’s kinda fun. As long as I don’t promise more than “I’ll look into it,” I’m golden. I took about one deep breath, and there they were. No pressure, right? The girl was the oldest. Around twelve, she was obviously a non-believer by now, but playing along for her younger brothers. The ten-year-old was unsure. That phase where they don’t really think you’re real, but don’t want to blow their chances, just in case. The eight-year-old still had the faith. His eyes were large, brown, and round. “What’s that Santa?” the oldest asked, obviously the spokesman for the group. They looked puzzled, but when I explained they would not have to leave the foster family, that they could stay together, well, there wasn’t a dry eye in the house. Yeah, I teared up just now, again, though it was six years ago. So what did I learn? In the Hero’s Journey, the Hero comes back changed by their Quest. Though I didn’t leave my throne, I had just been on quite a ride. Santa has made me a better person. When I put on my super hero costume and go forth to fight for happiness, I never promise a toy, but I always offer a hug. I have a photo of my back side as I am hugging an elderly black man. 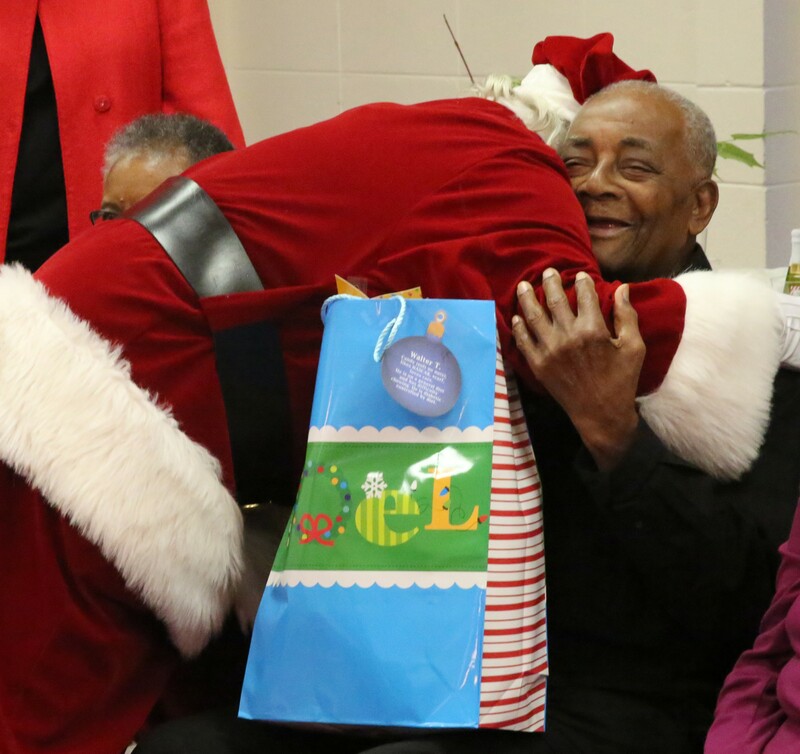 His name was Walter, and I met him at a gift exchange at an Alzheimer’s day care center. Every patient got a gift bag selected for them by the staff. I handed them out and hugged each one. Walter’s face is beaming, and a trick of the lighting perhaps, but I see a small halo around his head. I got the photo from his daughter who tracked me down. She said her dad had been abandoned as a child, and had never had a visit from Santa his entire life. The next year I was told that Walter had passed. His daughter told the director of the daycare center the photo of me hugging him had become his favorite, and at his funeral his daughter had that picture blown up and placed on an easel beside his open coffin. That taught me how powerful even one moment can be in another person’s life. Don’t hold back. This moment may never come again. The Greek philosopher Heraclitus once said that a man can never cross a river twice, for each time both he and the river will have changed. Every time I assume the role, it may be the first time for whoever I come into contact with. I may define Santa for the rest of their life. No pressure, right? But here’s the thing. Just like Dumbo and his magic feather, the magic is not in the robe. It was inside me all the time. I just needed the license the costume gave me to tap into it. 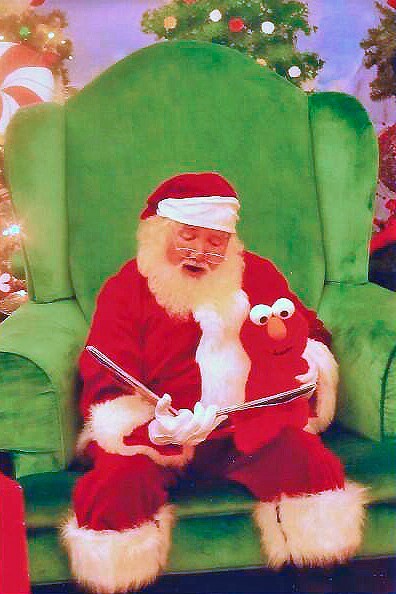 You may not wear a red suit, but I hereby deputize you to share love and joy, wherever you go. You can do it. Find that better angel that has been inside you all along, and let them breathe. You, and all those around you, will be the better for it. PS: Three nights ago, a little girl around five came up to me with her letter to Santa. On it were several letters carefully inscribed but not forming any words I could discern. 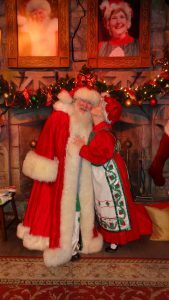 PPS: My wife was hired the following year as Mrs. Claus. Adventures are more fun with the right companions. 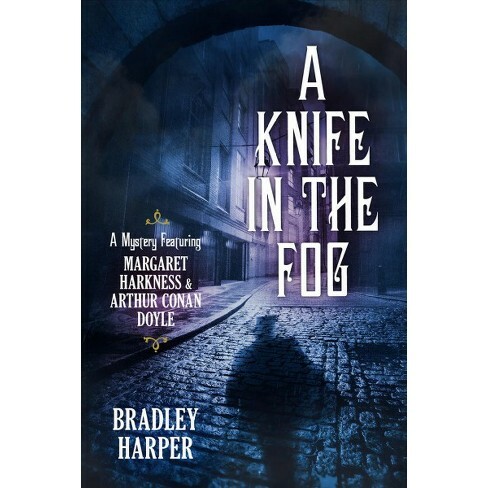 Bradley Harper‘s writing credits include a short story sold to The Strand and The Sherlock Holmes Magazine of Mystery, as well as his debut novel, A Knife in the Fog, featuring a young Arthur Conan Doyle, Professor Joseph Bell (Doyle’s inspiration for Holmes), and Margaret Harkness. Miss Harkness was an author and Suffragette who lived in the East End of London for a while to do research on her novels featuring the working poor. Together these “Three Musketeers” assist the London Metropolitan Police in the hunt for the man who became known as Jack the Ripper, until he begins hunting them!